Twitter, in addition to serving as a personalized news service for people who like to follow the feeds of their favorite Web sites, newspapers and TV stations, recently introduced its own emergency alert system. Although it’s not to be confused with the government’s Wireless Emergency Alerts, more than 100 Federal, state and local agencies are participating in Twitter Alerts as well. 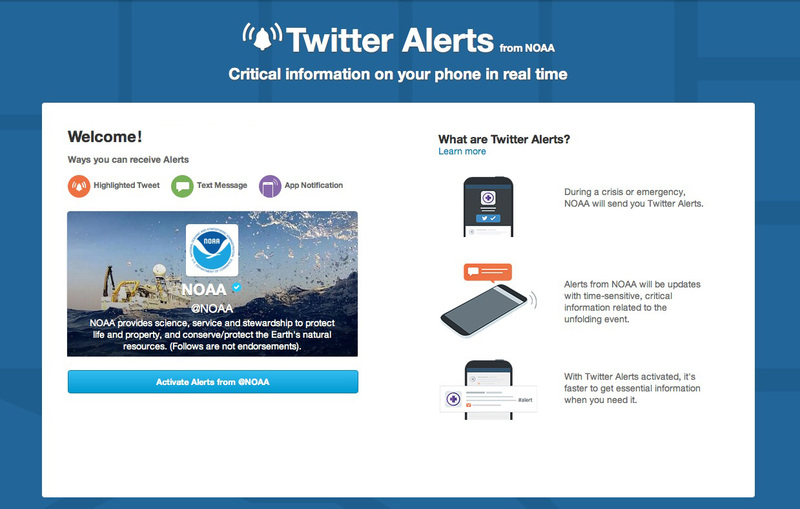 To sign up for an alert from an agency like NOAA or FEMA, visit the page of participating organizations on Twitter’s site. Click the ones you want and fill in your information. You’ll get alerts by text message, push notification and as entries in your news feed. In addition to Twitter, you probably some news and weather apps on your phone as well. Most newsy apps let you set up notifications on your phone when they have important information to push out — things like wildfires, winter storms, traffic problems or breaking news events. Apple has information about using Notifications in iOS here and Google has similar information for Android here. Red Sox or Cardinals fan? Yeah, you’ve probably got your alerts set up already, even if you’re watching the games.